Most westerners are accustomed to learning from the written word. However, much of the world cannot, or does not, prefer to learn through predominantly literate means. In this context, oral story telling can be a very effective way to communicate. 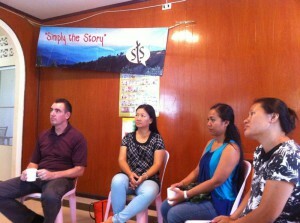 Last fall, the Charis Project hosted a Simply the Story training. Simply the Story, or STS, teaches people to interact with the Bible through oral story-telling followed by inductive questions. This method is designed to work well with illiterate audiences, audiences from predominately oral cultures, and learners from any culture who prefer oral or visual presentations. We believe the wisdom of God’s word can be helpful to all people, whether they are Christian or not. 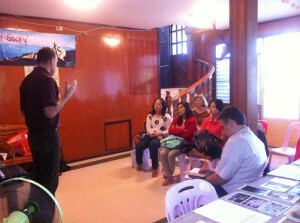 Several local NGO workers attended the training, including Charis staff. These men and women work closely with low-income families and children to help empower them toward their best life possible. They each have many opportunities to teach and train others. The tools they gained from the STS training enable them to talk about God and the stories from the Bible in a way that translates well into the culture and the educational experience of their audience. Almost all of the learning was done with no notebooks, pens, computers, or power point presentations. Just people learning and sharing with voices, hearts, minds, and the power of communication. Yet we were experiencing lively encounters with God’s Word. STS values all parts of the Bible, including the stories usually relegated to flannel graphs in the Sunday school room. In the Western church, we often focus on the Old Testament books of law and the New Testament letters to the churches. We often only teach Old and New Testament stories to children in Sunday School. However, much of the world has a rich heritage of learning through stories. STS taps into this heritage by bringing the Biblical stories to life once again. 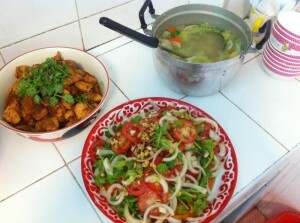 Lunch break included delicious Burmese food by a local chef. Friendships are formed between members of many different organizations at events like this. We got to see the positive results of this methodology in action. Each of the participants had the opportunity to become dynamic facilitators, sharing what they had learned when their time to present came. In addition, the impact of the stories was magnified by the story-telling format. The real power of the tool is the ease with which God’s Word can be shared, when it is presented as a useful or interesting story. Jesus often answered a question with a story of His own. Stories reach our hearts and minds at a depth that lectures often cannot. Having life-giving stories at the tip of their tongues can help the local community worker to respond well when a family shares that they have a particular struggle or issue. As the Charis team seeks to encourage, empower, and educate people, families, and communities, we see how telling powerful stories about the love of God will be an invaluable tool.